In only 500 years, humankind has shaped science and reached the current scientific achievements. In just half a millenium, we have walked on the Moon, created machines to think and act on our behalf, and developed elegant theories whereby we can understand and predict the behavior of the macro- and micro-universe. On a cosmic scale, all this occurred in only about 0.0000036% from the known age of the Universe. How then should we expect science and technology to influence humanity in the next 100 years? Most of the scientific articles and books providing predictions on how science will evolve over the next century address the possibilities and achievements of physics and technology as tightly dependent. These achievements are actually the general practical aims for the survival and progress of civilization – health, optimization, wealth, energy sufficiency and space travel. Scientists making such predictions also outlined the aim and necessity for understanding the Universe and our place within it. While admitting that a prediction is never and was never a certainty, we can fairly assume that the laws of nature and well established theories are unlikely to change in the next 100 years. As physicist Micho Kaku (2011) writes in his excellent science prediction book , the main reason for that is that the four fundamental forces that drive the entire universe – namely, gravity, electromagnetic, and the weak and strong nuclear forces – have been established and the only premise for making a prediction authoritative is the adequate grasp of these forces. Technology provides the central focus of the predictions, which is justified, as technology is actually the ultimate means of achieving the practical aims mentioned earlier. However, the scientific and technological achievements are mutually dependent. Scientific knowledge grounds the engineering innovations, and nowadays science is essentially developed from an observational base built through laboratories and technology. This link between science and technology is the main principle that drives the entire story here and enables prediction. In addition to this link, a historical and interdisciplinary approach combines with understanding to create continuity; not by simply discovering the laws of nature but only by understanding those laws can humans continue to refine them toward practical application. Talking historically the contemporary achievements of space travel and exploration, we started from placing our first satellites in the terrestrial orbit and landing on the Moon. Robotic exploration, either as land rovers or orbiting, has reached a technological level allowing soil composition and structure to be analyzed for the presence of primitive life forms as well as its potential to sustain life – and even for ‘terraforming’ – on planets like Mars and natural satellites like Jupiter’s Europa. Robotics also serves for the improvement of telescopes in the search for new planets and in search of liquid water. Ground-based telescopes discovered new planets at the rate of one to two per week using the principle of ‘star wobbling’. This approach changed with the development of space telescopes (note 1), which scan thousands of stars looking for tiny fluctuations in starlight, thereby potentially discovering hundreds of earthlike planets. Another satellite, LISA (Laser Interferometer Space Antenna), scheduled for launch in early 2030, will measure a new type of radiation, namely gravity waves from the moment of the big bang itself. In other words, LISA may be able to do the impossible: reveal what happened before the big bang! LISA is a project led by European Space Agency (ESA). The LISA study team consists of independent U.S. scientists with expertise in gravitational wave technologies, signal analysis, and astrophysics, working closely with ESA specialists and NASA engineers (note 2). LISA is structured as a giant triangle of three satellites, three million miles apart, connected by three laser beams, orbiting around the Sun at the same distance from the Sun as the Earth, but trailing the Earth by 20 degrees. Any gravity wave reverberating from the big bang will disturb the satellites and alter the laser beams, and the sensors will record the frequency and other characteristics of the disturbance. Such sensitivity has never been attained by previous generations of telescopes (note 3). LISA’s basic principle is that massive moving objects distort spacetime and produce gravitational waves, according to the Theory of General Relativity. Some of these gravitational wave events will cause the three LISA spacecraft to shift slightly with respect to each other and will produce a characteristic pattern in the combined laser beam signal that depends on the location and physical properties of the source (NASA, 2017). LISA can measure the gravity radiation emitted after the big bang and compare it with the various predictions of string theory, a theory describing the pre-big-bang era. Under these premises, unveiling the origin of the big bang in the near future may be a real possibility. In brief, the dual symmetry of a string (the mathematical primary entity of String Theory) allows (mathematically) any cosmological phase subsequent to the big-bang singularity to be preceded in time by a symmetric phase occurring before the big bang. Such a dual symmetry should also leave an imprint on the properties of the cosmological perturbations, including gravitational radiation. The fundamental length λs, which controls the typical size of a quantized string, also induces a constraint on the Hubble radius. Since the Hubble radius is directly related to the inverse of the spacetime curvature, we can deduce that the curvature cannot blow up to infinity at time zero of the big bang. In such a context, the big bang singularity predicted by the standard model has to be replaced by an extended phase of very high (but finite) maximal curvature: the so-called string phase. In conclusion, by combining the existence of the dual symmetry and of a minimal length scale, a string-based model can thus complete the standard cosmological scenario by removing the curvature singularity and extending the physical description of the Universe back in time, continuously, beyond the big bang, to infinity. String Theory, as beauty as any mathematized theory of the theoretical physics, has never been tested empirically, nor popularized, like the Theory of Relativity was. Now, LISA might change that. LISA is a marvelous example of collaboration between science and technology, with the ultimate goal of understanding of both the universe and theories describing it. Not only does LISA use general physical theories about the universe, but also it serves for testing such old theories. Gravitational-wave astronomy uses direct measurements of gravitational waves to study astrophysical systems and to test Einstein’s theory of gravity. But what it is really challenging and breathtaking is that such measurements could test new physical theories of the early universe. One of them assumes a universe with vanishing dimensions. If the universe in its infancy had only one spatial dimension and acquired more as it expanded and cooled, some of the most intractable problems in physics disappear (note 4). According to the grounding math, there should be no gravitational waves at all emanating before the universe was tridimensional. Above some maximum frequency corresponding to a certain energy and time in the universe’s history, LISA should see nothing. Mureika and Stojkovic (2011) showed that the frequency cutoff is about 0.0001 Hz, right in the frequency range that LISA is designed to sense. Based on well established physics and technology, LISA will surely become more technically enhanced until the launch (note 5) and will probably reach its goal of enriching our understanding about the origin, shape and dimensionality of our universe. But scientists aside, are we prepared to receive such knowledge? Current science and progress were attained in 500 years. Such progress is self-accelerated; however, science education has been left far behind. Assuming all the optimistic predictions on scientific achievements will occur in the next 100 years, is this enough time for educating humanity and preparing for radically changing concepts and beliefs, adapting to the robotic era or even moving to another planet? Evolution does not like and does not deal well with such short timeframes. It seems that science education has tough interdisciplinary “rush job”, and a consistent theory of scientific prediction must emerge as a branch of the history of science. This refers to the telescopes on the Kepler Mission launched in 2009 and on the COROT satellite in 2006. Over 300 scientists and 1300 researchers were involved, according to (Danzmann, 2017). That is, optical or radio telescopes. Briefly, if we imagine this shrinking-dimensional universe as a woven tapestry, as we get closer, the tapestry looks more and more like a flat, two-dimensional piece of fabric. Looking through a magnifying glass reveals that the whole thing is actually a one-dimensional piece of string, folded over on itself. One can think of the universe as a very long string that just folded as the universe expanded (Anchordoqui et al., 2012). Some of the technology items have been tested on LISA Pathfinder, a spacecraft launched in 2015 (ending mission in 2017) as a proof-of-concept that tests that the noise characteristics of free-floating test masses within the spacecraft are small enough compared to an expected gravitational wave signal (NASA, 2017). Other items are still in ongoing testing (Danzmann, 2017). Anchordoqui, L., Dai, D. C., Fairbairn, M., Landsberg, G., & Stojkovic, D. (2012). Vanishing dimensions and planar events at the LHC. 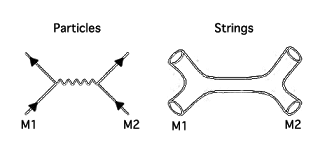 Modern Physics Letters A, 27(04), 1250021. Danzmann, K. (2017). 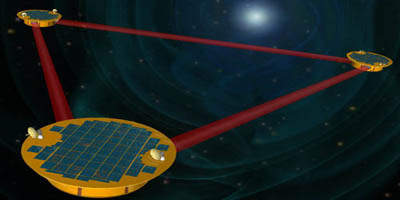 LISA Laser Interferometer Space Antenna. A proposal in response to the ESA call for L3 mission concepts. LISA (official website), retrieved from https://www.elisascience.org/files/publications/LISA_L3_20170120.pdf . Kaku, M. (2011). Physics of the future: How science will shape human destiny and our daily lives by the year 2100. Anchor. Mureika, J., & Stojkovic, D. (2011). Detecting vanishing dimensions via primordial gravitational wave astronomy. Physical review letters, 106(10), 101101. NASA. (2017). LISA. Official website, https://lisa.nasa.gov/index.html, retrieved on 10.01.2018. 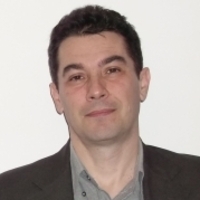 Catalin Barboianu is mathematician and philosopher of science. He is the founder of PhilScience.